Hell yeah is right! I finally did it. I managed to finish the Tour Divide in 27 days, 5 hours, and 42 minutes, and I did it alongside my riding friend Paul Howard of the UK. There were times when I didn't think I would make it, but here I am, finally back home in Montreal, eating something other than energy bars, tortillas and peanut butter! I have to say congratulations to all the other fellow Divide riders who pushed themselves to the limit and competed in the event, finishing or not. It takes a lot of courage even to gather at the starting line in Banff and commit yourself to something so life changing. You can never really realize the physical/mental/emotional extent of this race until you actually do it, and to be able to finish it still blows my mind. I think the last day was definitely the most dramatic/beautiful/crazy/wonderful of all. We had left at 4 am that morning in order to beat the desert heat. A few hours later we had just watched the most amazing Mexican sunrise and were all giddy that we had made it this far and couldn't wait to celebrate with some Dos Equis beer. Suddenly Per (another fellow rider from Sweden) hit some loose sand and crashed, really giving us a scare. He started to convulse, then passed out, lost short term memory, got better and came to and rushed away in an ambulance. This was all before 7 am, 3 hours after our start, 90 miles from the finish. Fortunately he got a clear bill of health, other than a slight concussion, and was just happy he hadn't done some real damage to his body. For the rest of the ride Paul and I were pretty somber. Reflective isn't a strong enough word to illustrate how we were feeling. 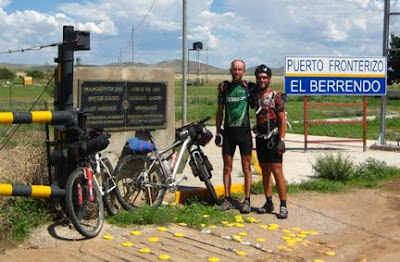 In the end we both felt lucky to have been able to finish, and were thankful to the bike gods for allowing us complete our journey to Antelope Wells, Mexico. The people of Silver City also made the finish what it should be. They were more than helpful in making sure we were taken care of. People were stopping us on the highway to cheer us on, telling us they had been following our Spots all the way in. Gila Hike and Bike were fantastic. Jamie (a local Divide racer) let us crash at his house and told us stories of his experiences along the way... he sure is an amazing character. We also met up with Baren Beard, Mimbres Man!! He was even kind enough to drive us to Phoenix so we could catch our planes. He couldn't say enough good things about the race and what it meant to bike fanatics. The Tour Divide is definitely a special event in a special place. It goes to show how bikes break down so many barriers and open so many doors. There are so many good vibe ripples that are sent out through this event its unbelievable. It has been an honor to have participated in it. I just hope it doesn't change the more popular it gets. A big thanks to Matthew Lee and all the others who helped organize the race and put in many sleepless nights to make it possible. I really have to give a big thanks firstly to all my sponsors and friends who made this possible and helped me to finish the race. Without their support I wouldn't have been able to make it as far as I did. Thanks to Oakley, Golite, In-Sport and Osprey, Tarptent, Rocky Mountain Bikes, and Carousel for making such great products... my set-up was indestructible the whole time, allowing me focus on the trail. Thanks to all my friends and family in Alberta for your moral and financial support, especially my mom and dad, sisters and the Tanners. Thanks to everyone in Montreal who helped me get on my way with your generosity, I couldn't have made it to Alberta without you. I also have to give a big thanks to all those people along the race who opened there arms and hearts, fed us, kept us safe and dry, bought a round for us, and made sure we were taken care of to get back on our bikes and continue on. To all you kind people, I hope I can return the favor one day. Most importantly I have to thank my girlfriend, Rachel, who saw this crazy race idea form in my head in the beginning and said "go for it!". She was my inspiration for finishing the race and has always been there for me, pushing me on to explore the world on two wheels. Would I do this again? If you asked me on day 10 I would have immediately said "no!". But looking back... I may return next year to shave some time off and put my new divide knowledge to the test. You can also read some press out in my hometown of High River, Alberta. The article is written by Don Tanner for the High River Times. Just found your blog via your link to mine. Speaking for the Silver City bicycle community, glad to help...any time.